with Andy Taylor, aided and abetted by Prof Richard Zimmerl, John Anthony, and many others. 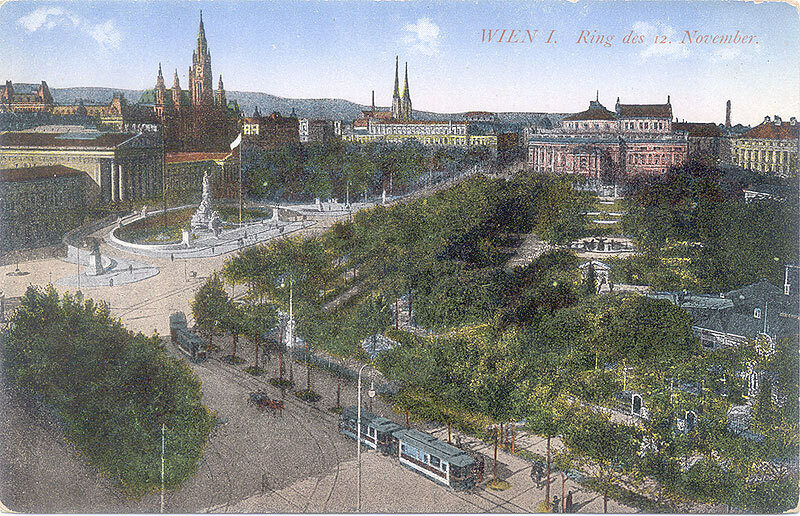 On 26 Oct 2008 the tram network of Vienna lost one of its best-known features: the around-the-Ring services. Tram route 1 went with the clockwise flow, running on the inside of the vehicular traffic (apart from the Schwedenplatz section). Route 2, however, ran anticlockwise and on the outside – a feature that numerous tourists only discovered when with loud clangings and screechings sudden death missed them by millimetres. 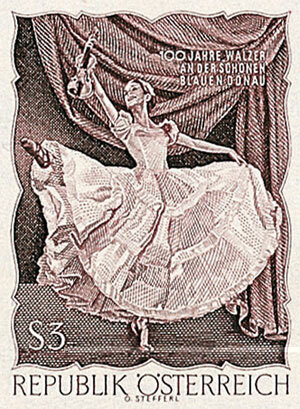 We’ll hop on board an old Route 1 at the Opera and look for buildings and scenes shown on stamps and postcards. 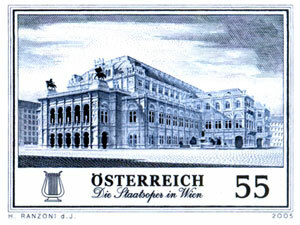 This panoramic view of Vienna as seen from the top of the Hochhaus in Herrengasse is the 1964 set issued for the WIPA exhibition in 1965. It shows most of the buildings we'll meet on our trip round the Ring. We set off along the Opernring (between 1917 & 1920 called Kaiser-Karl-Ring). [**] On our right is the statue of Goethe, glowering disapprovingly across the traffic at Robert Stolz Platz, one of the many things in Austria named after the composer. 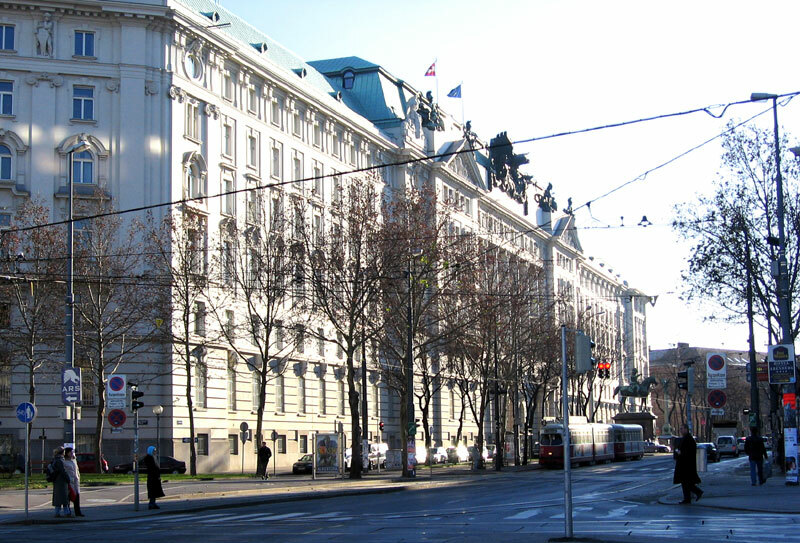 Behind Stolz is the Schillerplatz and the Academy of Fine Arts. **A note to those who worry about the correct writing of German. Until the "spelling reform" of 2005, only the last two words of a multi-word name were hyphenated, hence Kaiser Karl-Ring. From 2005, all the words get a hyphen, hence Kaiser-Karl-Ring. In practice you'll find versions with all, some or none! 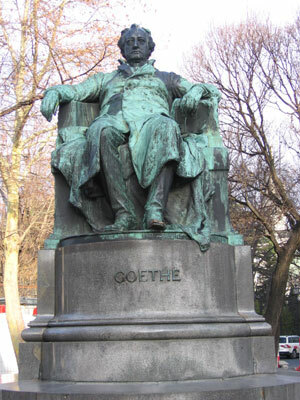 Next to Goethe is the Burggarten. This contains a large statue of Mozart formerly in Albertinaplatz, and what may be the only statue in Vienna of Kaiser Franz Josef. At the bend, the name changes to Burgring and the scenery widens out dramatically. For a period till 1940 the Burgring was called Dr.-Ignaz-Seipel-Ring after the Chancellor in the First Republic, and from 1940 to 1945 Josef-Bürckel-Ring after the Nazi Reichskommissar. On our left are the twin Museums of Art and Natural History, the former also containing the Münzekabinett with its philatelic rarities (entry only by prior application and a good reason). Between them is a huge statue of Maria Theresia, and behind lies the new Museumsquarter, which used to be the Imperial Stables! 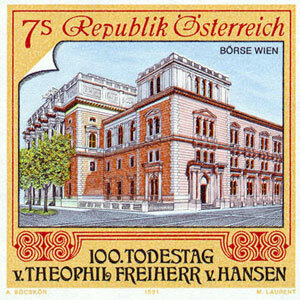 The illustration on the post card is by Hannes Margreiter, the internationally famed stamp designer. 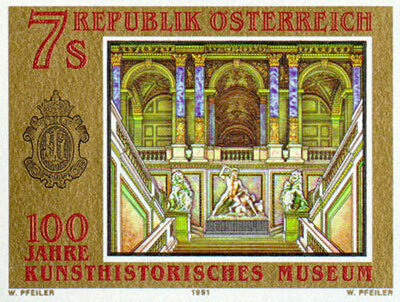 The stamp on the left was issued in 1991 for the 100th anniversary of the K-H museum; it shows the main staircase (!). 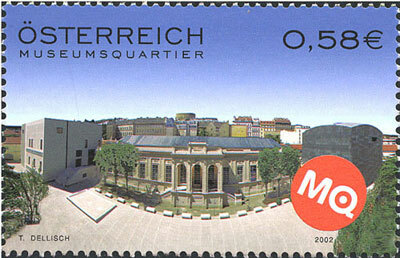 On the right is the issue of 2002 marking the opening of the new Museums-Quartier. 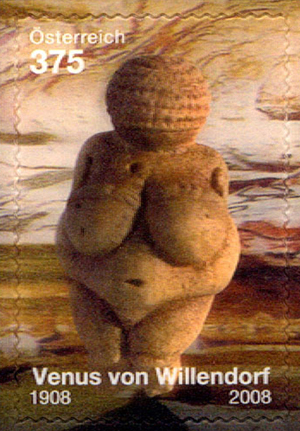 In the Natural History Museum lives the Venus of Willendorf, a stone age fertility symbol found near Vienna and about 24,000 years old. 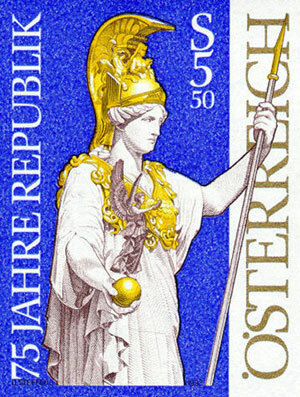 A recent Austrian stamp features a three-dimensional representation, achieved by "lenticular technology". 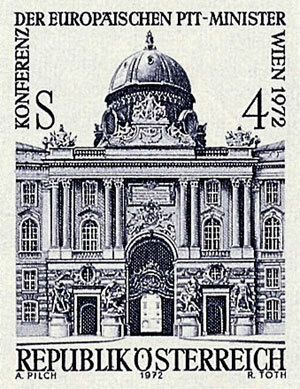 On your tram’s right are the buildings of the Hofburg, the seat of Imperial residence and government and arguably a virility symbol! 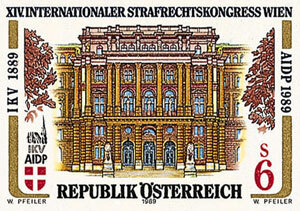 The Hofburg, as you would expect, features on numerous stamps; the three below are from 1972, 1975 & 1993. As you turn the corner from Burgring into Dr.-Karl-Renner-Ring, you can catch to your left a glimpse of the Palace of Justice. 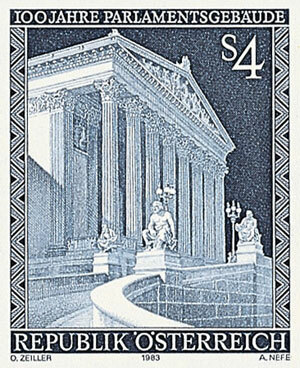 The frontage featured on a block of 8 issued in 1989; the amazing staircase appeared on an 1984 issue. This coloured postcard was printed in 1920, hence the caption ‘Burgring’. 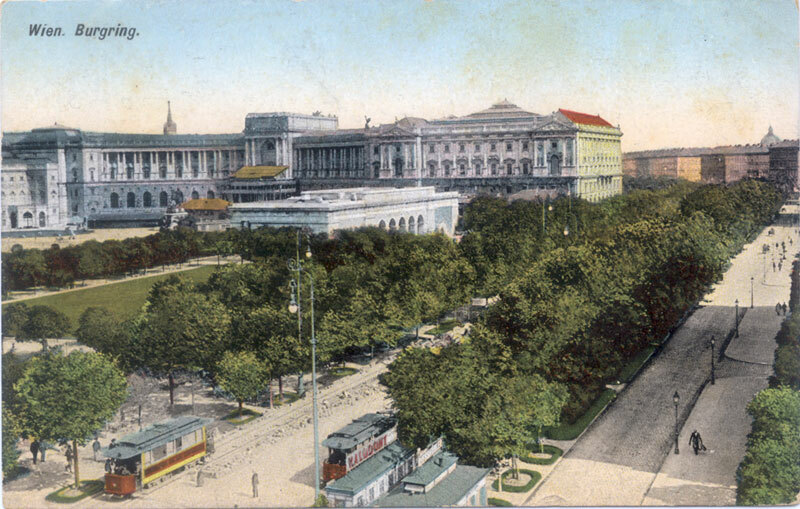 I have a B/W card posted to York in 1913: same publisher, exactly the same view, but captioned "Neue Hofburg mit Burgring". Round the next corner we enter Dr.-Karl-Renner-Ring, which runs past the Parliament building. It is named for the first President of the First and also of the Second Republics. 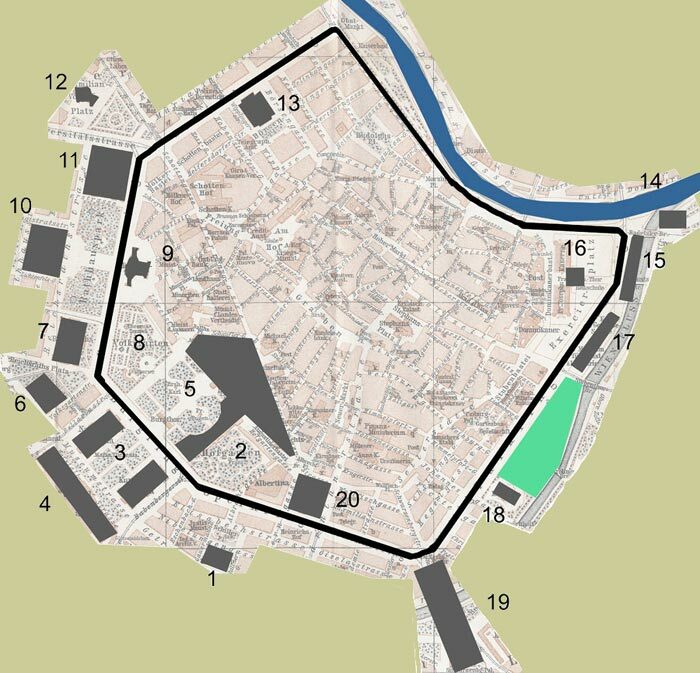 It was originally part of the Mölkerring, and then was called Franzensring (after Kaiser Franz I). From 1920 to 1934 it was Ring des 12. November, marking the proclamation of the Republic in front of the Parliament building on that date in 1918. This card shows the corner of today’s Burgring and Dr-Karl-Renner-Ring. 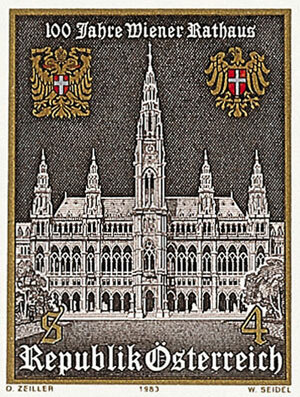 The Parliament building is clearly seen, with the Rathaus behind. In the middle the Votivkirch lies behind the University, and on the right is the extensive Volksgarten in front of the Burgtheatre. The card is captioned "Ring des 12. 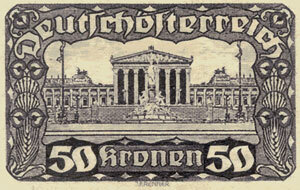 November" so it must have been issued between 1920 and 1934. 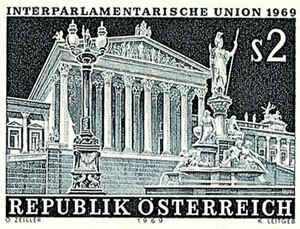 The Parliament building appears on numerous stamp issues, from 1919 onwards. 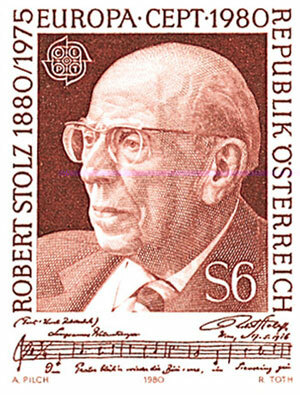 The stamps above were issued in 1919, 1969 & 1999; on the left is 1963. They also show the changes in design and printing techniques. 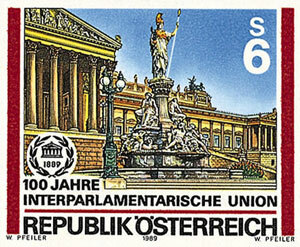 On the right is the 1993 stamp showing the statue of Pallas Athene outside the building. After the Burgtheatre the name becomes Dr.-Karl-Lueger-Ring, named for the famous Bürgermeister of Vienna. Before him it was originally part of the Mölkerring. On your right is the Burgtheatre, and on the left the Rathaus (Town Hall). The Rathaus’ designer 100th anniversary of the building. 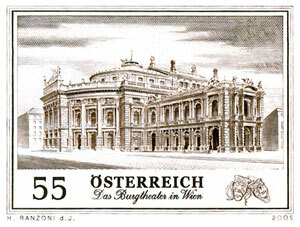 50th anniversary of the reopening of the Burgtheatre after WWII. This is the view from high up the Rathaus, looking back towards the Hofburg and the Museums. Today’s Dr-Karl-Renner-Ring is in the foreground. 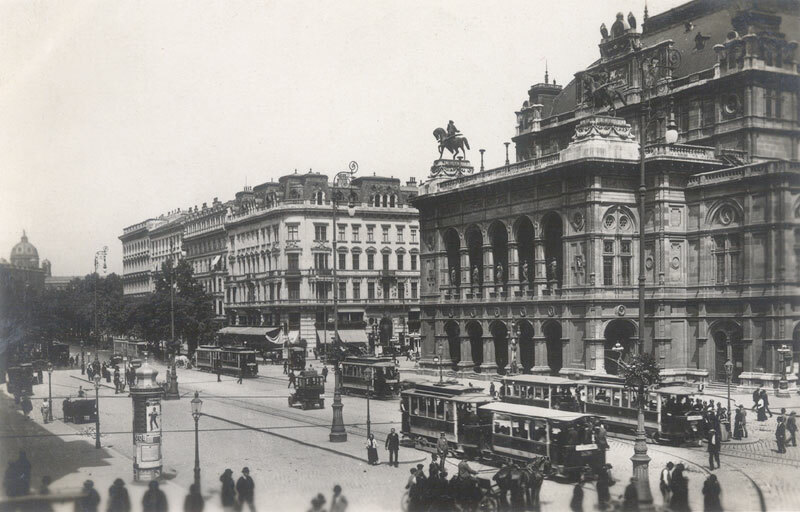 The Burgtheater, seen from the Rathaus balcony (undated but pre-1919). The famed Christmas Market is held on the open space. 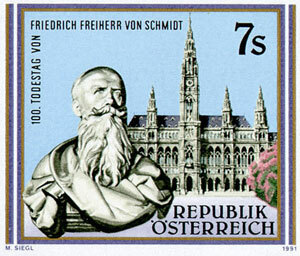 Lurking in the bushes of the garden in front of the Rathaus are many statues to persons commemorated on stamps – notably Dr Renner. 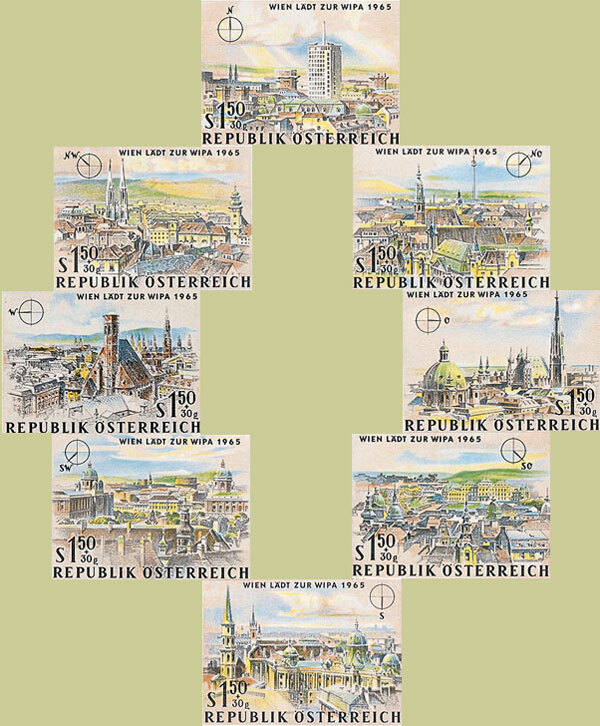 It is also the site of the famous Christmas Markets and the Post Office In The Clouds – illustrated here by three of the Personal Stamps produced for them. Next, you pass the University on your left and then arrive at Schottentor which is named after the Schottenkloster, the nearby monastery of the Irish monks. To your left is the Votivkirche, a somewhat unloved building. The piece of ground around the church has an interesting history – it kept changing its name. 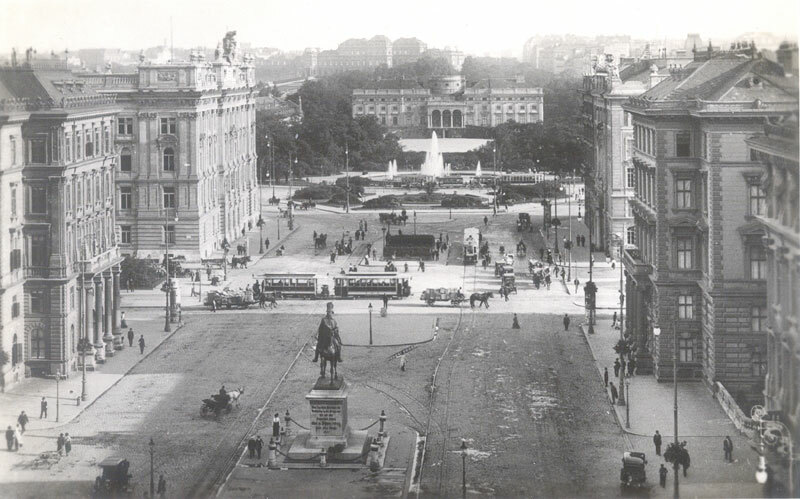 It was built in 1875 as Maximilianplatz, becoming Freiheitsplatz in 1920, Dollfuß-Platz in 1934, Adolf-Hitler-Platz (but only for two days) then Hermann Göring Platz in 1938, Freiheitsplatz again in 1945 and Roosevelt-Platz since 7 May 1946. 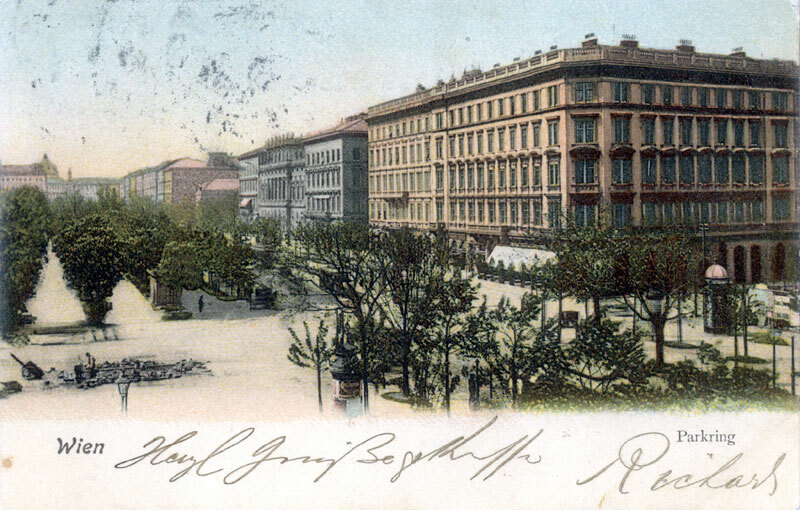 This card was posted in 1920, but printed when the ground was still called Maximilianplatz. 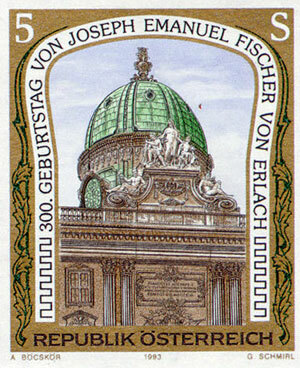 This card was printed in 1931, so it says "Freiheitsplatz". 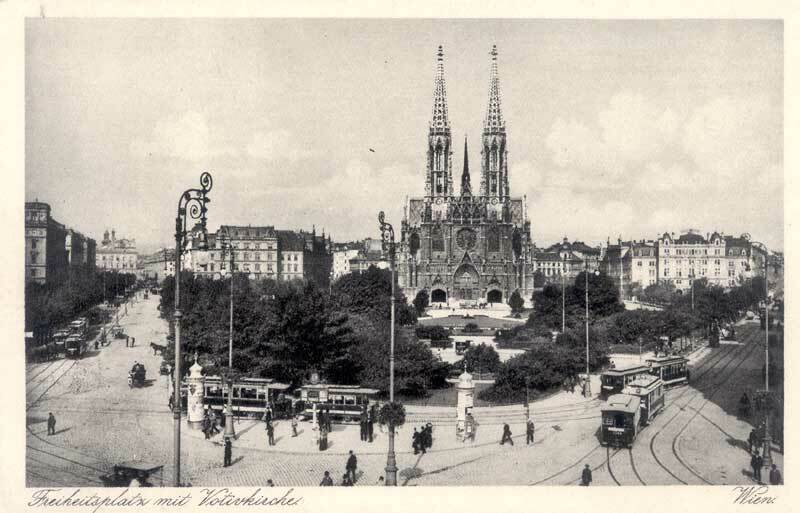 Note the traffic jam of trams - this was a problem for decades. Eventually it was cured by constructing a double-deck roundabout! The trams approaching from the right of the church turn below ground level; those from the left have their roundabout at ground level. This card was posted to London in 1908. 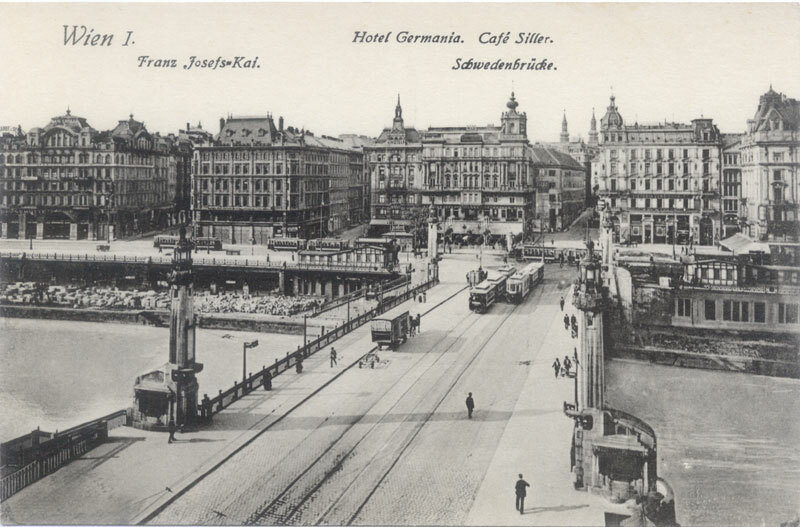 It shows Franz-Josefs-Kai at the Marienbrücke junction; the Hotel Metropole is the white building on the left. 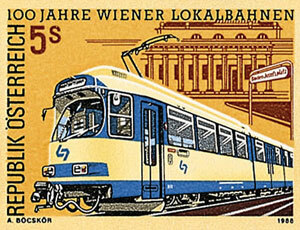 You are now at Schwedenplatz, a major tram and U-Bahn junction. 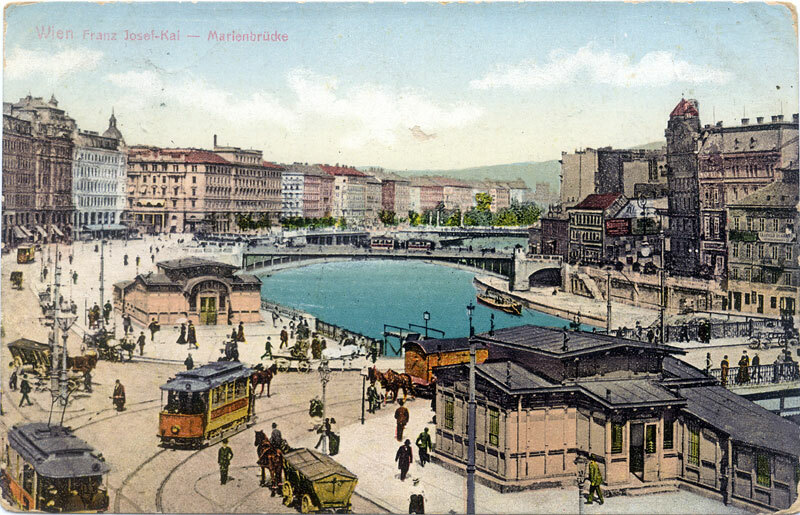 It is shown on the right of this 1923 card, the view being from the Leopoldstadt side of the Schwedenbrücke. Franz-Josefs-Kai continues until the Urania building, and as you approach you may get a glimpse to your left of the Riesenrad, the giant Ferris Wheel in the Prater. The card above, posted to London in 1900, shows it with all the cabins; when it was repaired after WWII only half were reinstalled. At the Urania building, your tram turns right into Stubenring, named for the old city gate of Stubentor. During excavations for the Stubentor underground station the foundations of the tower were revealed. The district was renowned in the Middle Ages for naked mixed bathing – not commemorated on a stamp! The photo above is the former Kriegsministerium on Stubenring, now occupied by various departments and ministeries. The Imperial Eagle still broods over the entrance. Opposite it, set back from the Ring, is the Postsparkasse, the headquarters of the Post Office Savings Bank which also handled all the money transfers. 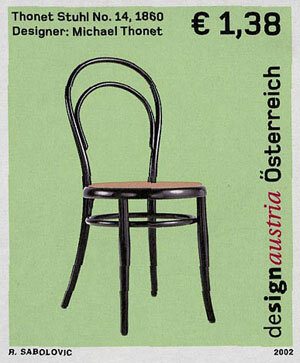 Next on your left is the Academy & Museum of Applied Arts, where such classics of design as the Thonet chair are displayed. 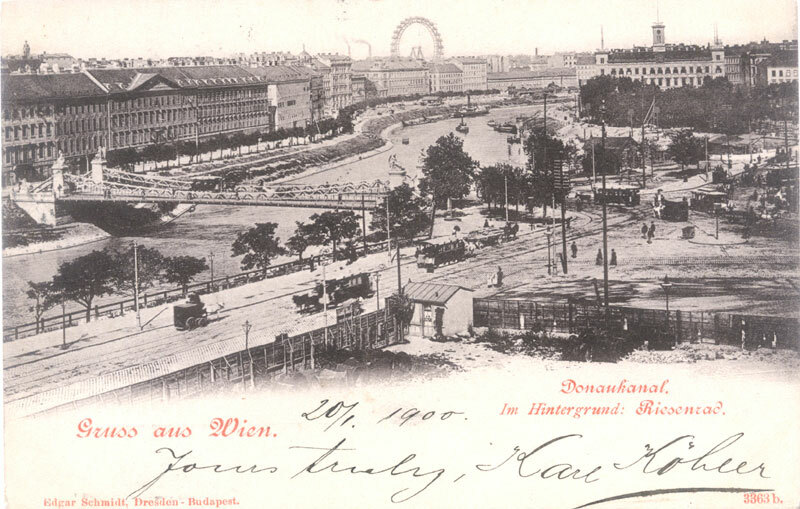 The Parkring takes its name from the adjacent Stadtpark; from 1910 to 1920 it was called Kaiser-Wilhelm-Ring after the German Emperor. 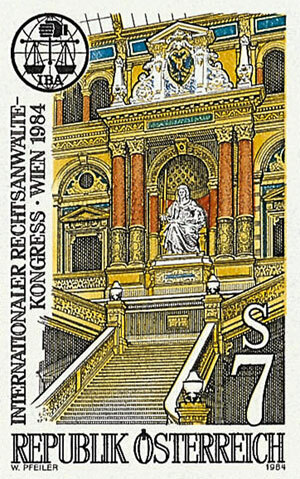 The Stadtpark contains many statues of people who are also shown on Austrian stamps (eg Bruckner, Lehár, Schubert & Stolz) but all are screened from the trams by the bushes. 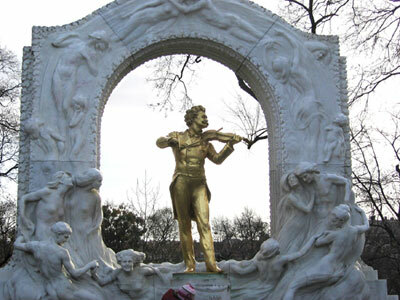 Using your imagination, you can see the gilded bronze monument to Johann Strauss II, unveiled on 26 June 1921. 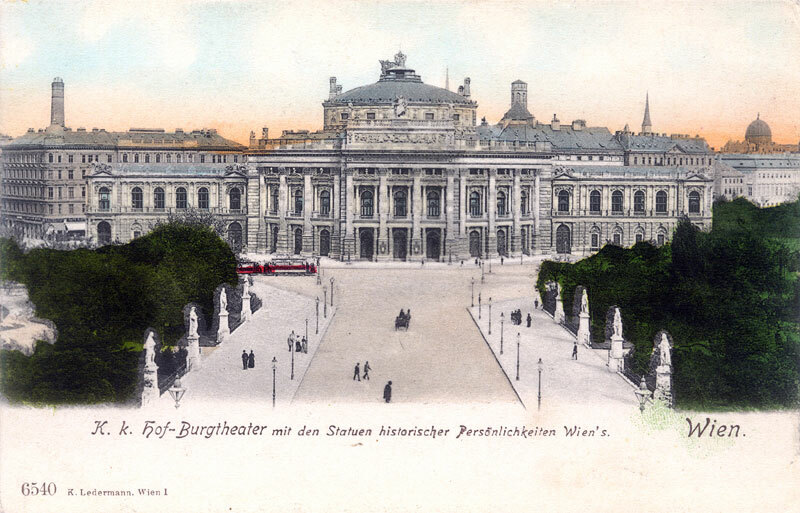 At the end of the Stadtpark is the Kursalon, opened in May 1867. 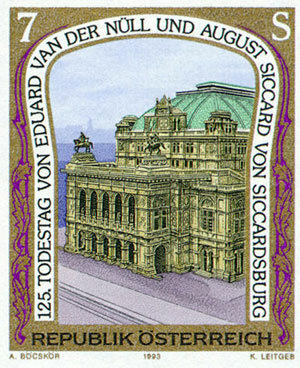 Johann Strauss II gave his first concert here on 15 October 1868. 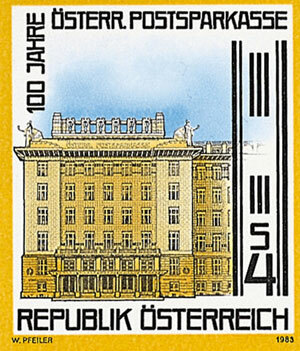 Today it is well known to philatelists for the biannual Numiphil dealers fair. 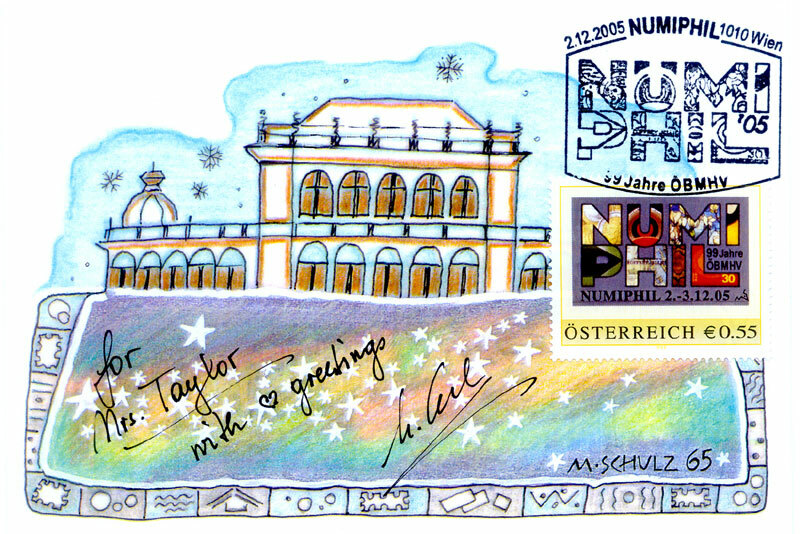 Above is a Personal Stamp produced to publicise it, and below is the commemorative card for 2005, with another Personal Stamp, a special cancel, and a dedication by the stamp designer & artist Maria Schulz. 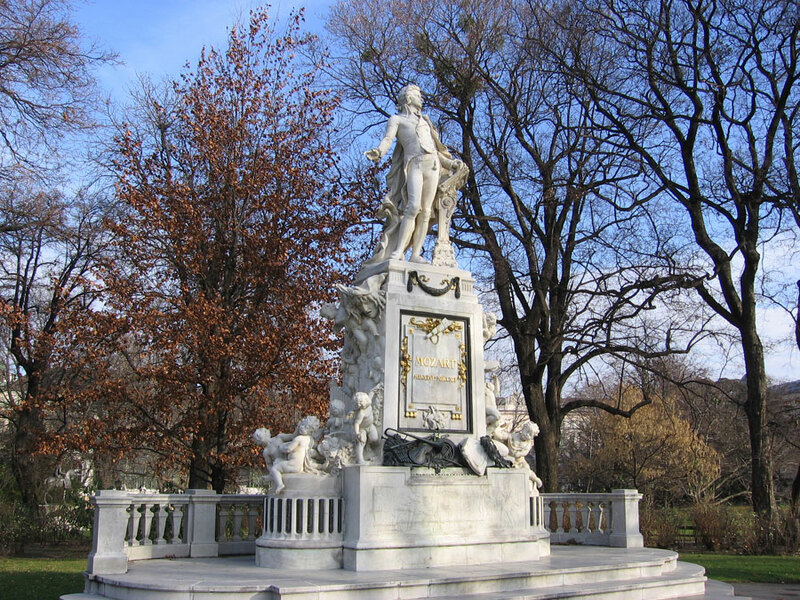 After the Stadtpark you enter Schubertring, named in honour of the composer Franz Schubert. 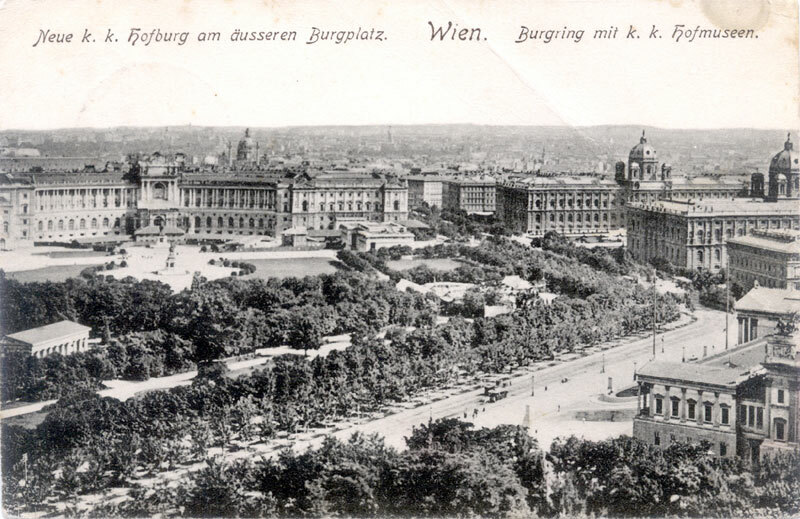 Until 1928 it was called Kolowratring after the old Palais Kolowrat, the Vienna residence of the Bohemian politician Franz Anton Graf von Kolowrat-Liebsteinsky. 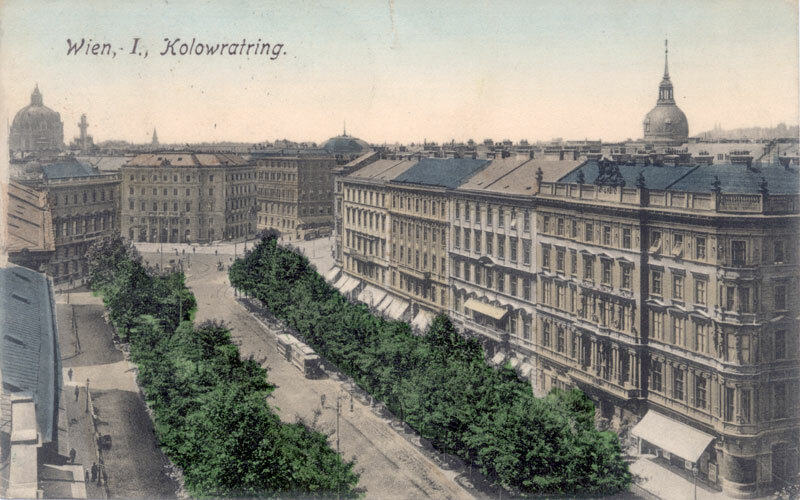 Postcard to Budapest captioned Kolowratring & posted 23 July 1908. 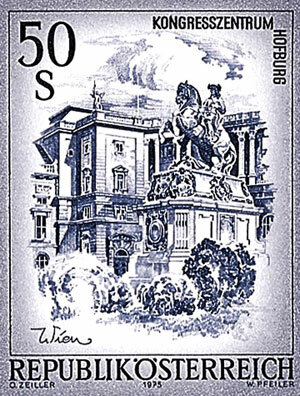 At the next corner you pass Schwarzenbergplatz on the left, another area rich in history but devoid of philately. 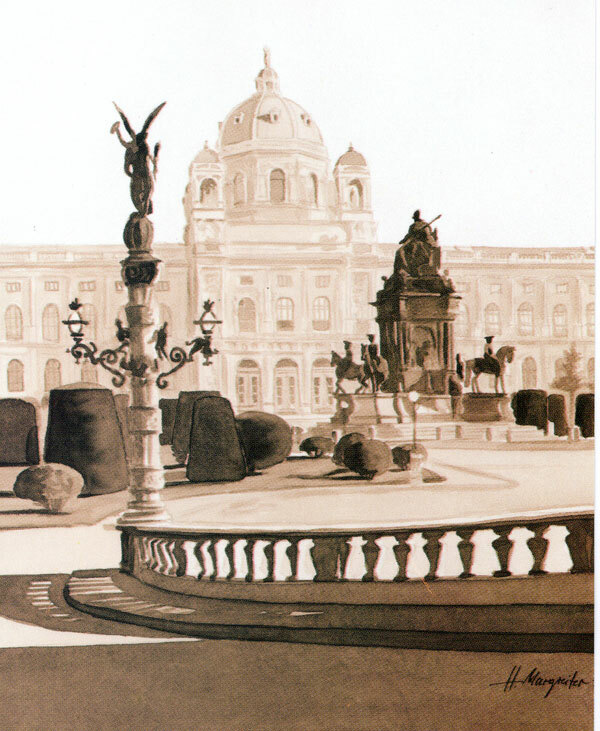 In the foreground is the statue of Prince Schwarzenberg; in the background the Hochstrahlbrunnen is in front of the Schwarzenberg Palace Hotel with the Belvedere in the shadowy distance. You can no longer see this view, as the huge wall of the Soviet War Memorial is just behind the fountain. 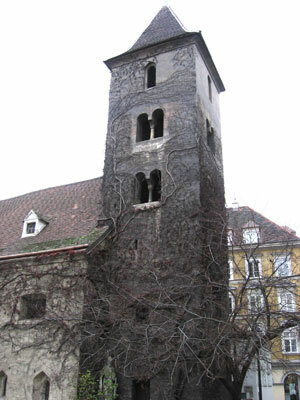 Now you enter Kärntnerring, which took its name from the former Kärntnertor. From 1917 to 1920 it was called Kaiserin-Zita-Ring. This card shows Kärntnerring; it is franked (or more likely decorated) with a 1920 newspaper postage stamp, cancelled (to order?) in Vienna on 20 Jan 1921. 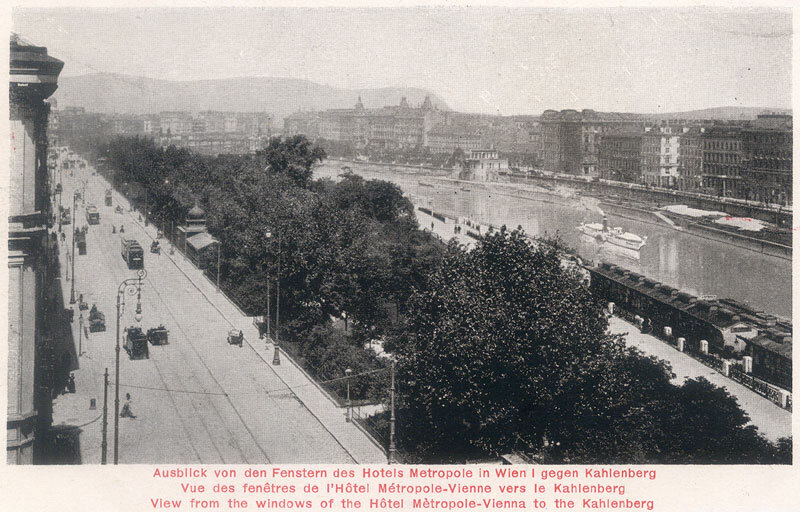 In the middle, what looks like the left member of a pair of trams is actually a small office; it probably was then, and certainly is now, the location of the ticket office for the Wiener Lokalbahn, which turns sharply down Kärntnerstrasse to its left and runs slowly but elegantly to Baden. The large building is of course the Opera House, where we began our journey. 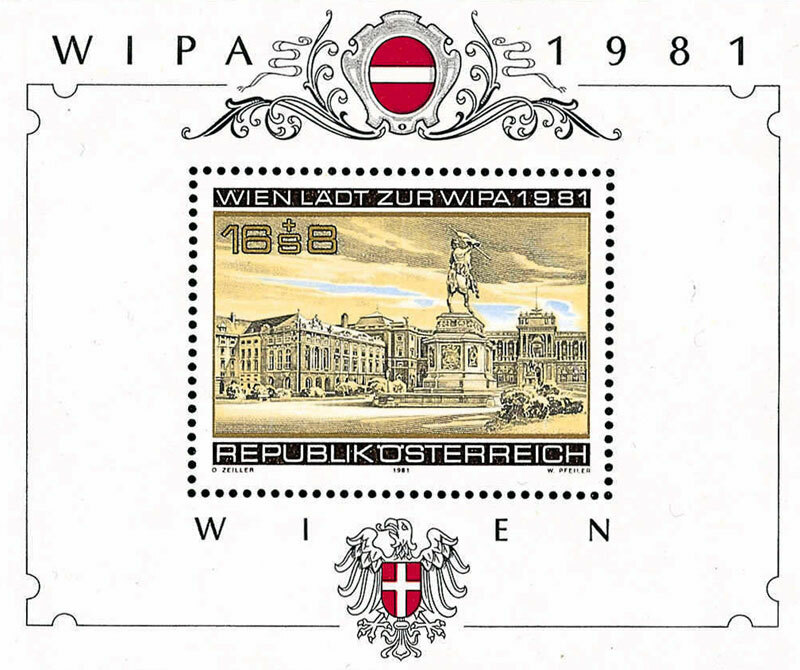 It is shown on many stamps; that on the right marks the 125th anniversary of the architects while on the left is the design of the 1955 stamp as re-engraved for the 50th anniversary in 2005. This shows the Opera House, where our trip began. 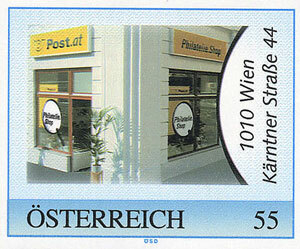 Finally, why not walk one block down Kärntnerstrasse to the site of Austrian Post Office’s first Philatelic Shop? 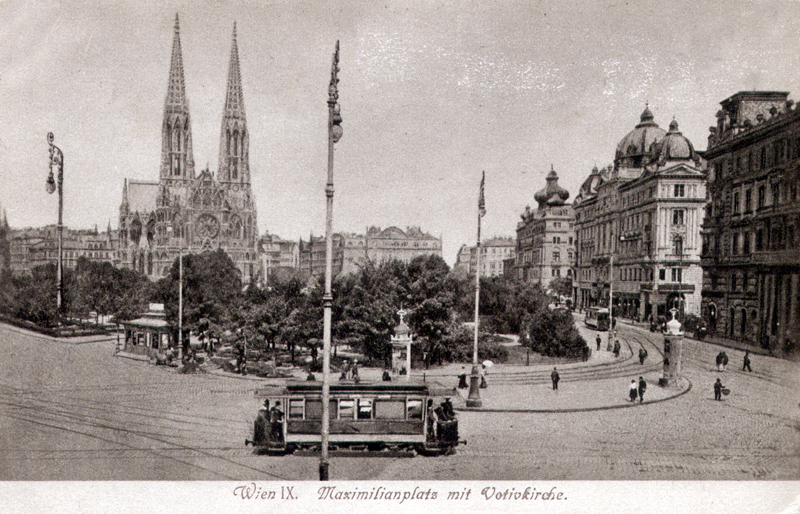 The card below shows Kärntnerstrasse from Karlsplatz looking up towards St Stephens. 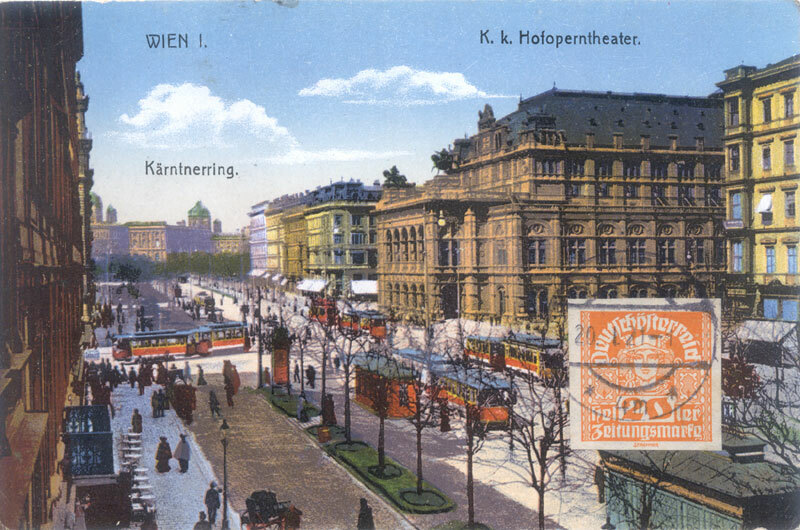 The tram crossing in the middle distance is on the Ring, and the Philatelic Shop was under one of the white awnings on the left, at the side street. 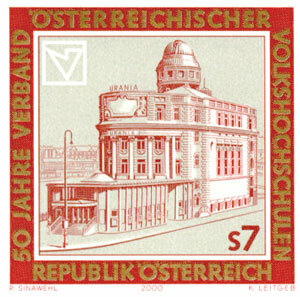 This stamp was issued to mark its opening.